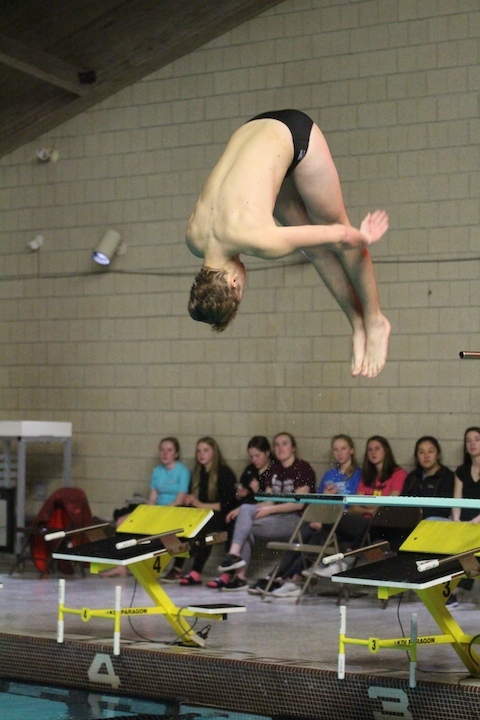 The Amity Spartans Boys Swimming and Diving Team hosted the Xavier Falcons at the Orange Town Pool on Monday, Jan. 14. 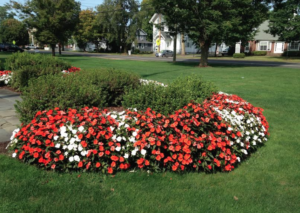 Amity was hoping to retain its perfect record. Our diver Kevin Tian was exceptional and beat Xavier’s diver Nick Kirejczyk. But in the end, Xavier simply outscored Amity 103-77. 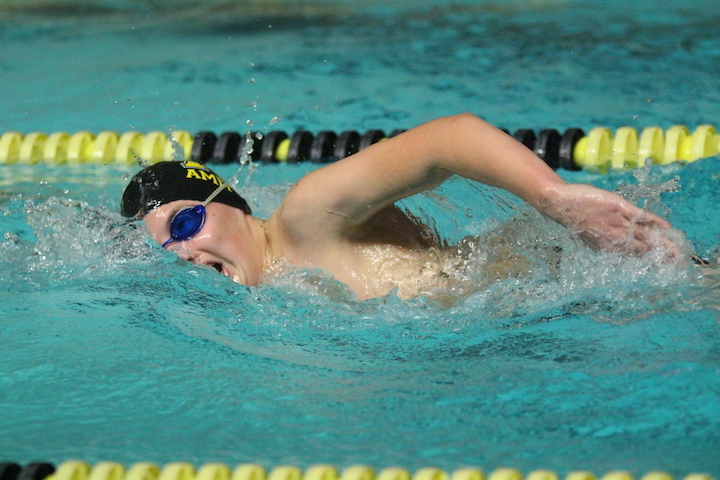 The Amity “Swimmin’ Women” AKA the Lady Spartans Swimming and Diving Team was on the road in Milford on Thursday, Oct. 4 for a meet against the Foran Lions. Next up for Amity: The girls are away on Tuesday, Oct. 9 in Glastonbury at 4:30 p.m.
Is Todd Rainey a super coach or are the Lady Spartans just that good? You may agree that either choice would be correct. 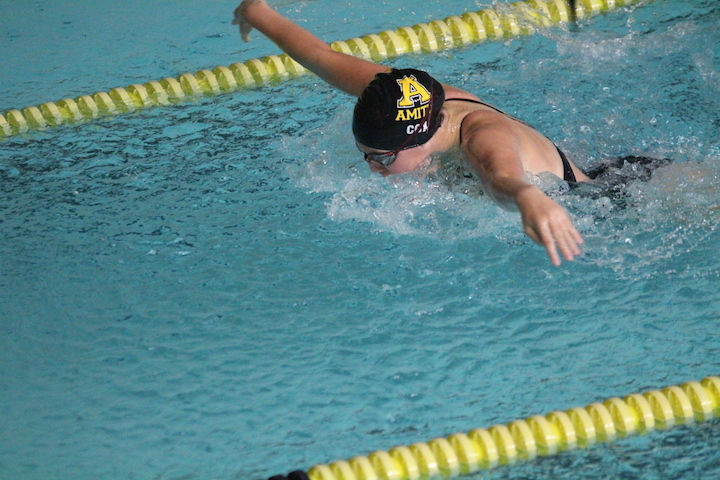 The girls varsity swim team was on the road on Monday, Sept. 21, and once again enjoyed a victory, this time in West Haven, deafeating the Blue Devils 88-79..
Make that five wins in a row for the undefeated Amity “Swimmin’ Women”. The Lady Spartans splashed past West Haven 91-82 in a Southern Connecticut Conference meet that wasn’t as close as the final score would indicate. Holding a commanding lead after Brittany Smith won the 500-yard freestyle in 5 minutes, 40.87 seconds, Coach Todd Rainey had his girls swim exhibition (non-scoring) for the meet’s final four events. The meet began with Madeline Snow, Lydia Pokluda, Dana Grindall, and Dana Chung winning the 200 medley relay with their time of 1:56.26. 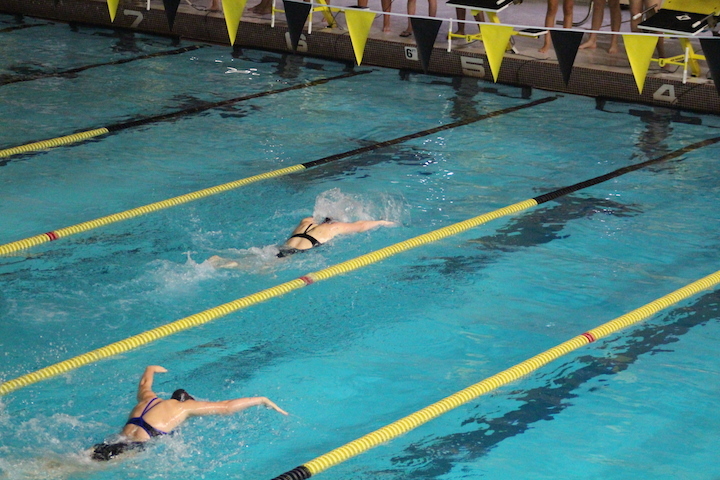 Jess Kochiss posted a victorious 2:03.08 in the 200 free. Snow’s 2:17.04 was tops in the 200 medley. That was followed by Chung winning the 50 free in 26.38. Gabrielle Syrop rang up a winning score of 163.40 in diving. Shannon Early chipped in with a first place 1:06.62 in the 100 butterfly and Grindall breezed to a first place time of 54.34 in the 100 free. Tonight, the 5-0 Lady Spartans host Glastonbury in what is expected to be a very hard-fought non-conference meet at the Orange Community Center pool, starting at 7:30 p.m.